Premier Li Keqiang met with Luxembourg Prime Minister Xavier Bettel on March 27 and the two sides expressed willingness to deepen mutually beneficial cooperation. Premier Li Keqiang met on March 27 with Lee Nak-Yeon, prime minister of the Republic of Korea (ROK), who is attending the Boao Forum for Asia annual conference in South China. Premier Li held talks with the Laotian prime minister, who came to attend the Boao Forum for Asia in South China’s Hainan. The Boao Forum for Asia annual conference concluded on March 29 in South China’s Hainan province, with consensus on regional and global cooperation reached. China has started to formulate matching regulations to support the implementation of the Foreign Investment Law, Premier Li said. China will further relax controls on market access and shorten the negative list for foreign investment, Premier Li said. 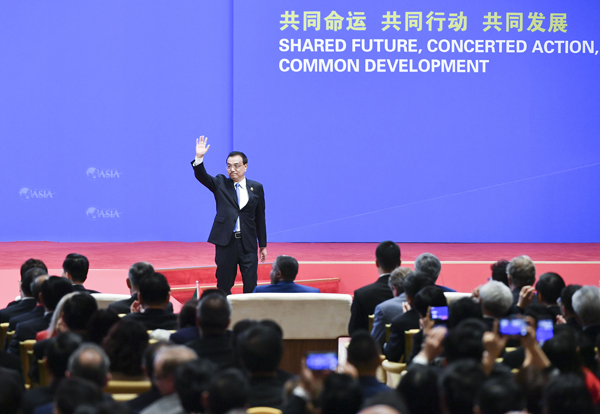 China advocates free and fair trade, Premier Li Keqiang said on March 28, urging reforms of the global governance system to make it more just and equitable.